A while back I was challenged by a visitor to the website. He needed a very loud sweeping siren type audio sound generator powered by 3v. He tried some of the commercial sirens but they were not very loud when powered by 3v. He also said that those devices demanded much higher current than he wanted to use. I gave this problem some thought and came up with a design below. The circuit uses a LTC1799 precision frequency generator from Linear Technology. A 74HC14 hex Schmitt trigger from Texas Instruments is also used to perform several other functions. One section is wired as a simple 7Hz square wave oscillator. The triangle waveform across that capacitor generates the low frequency sweeping signal for the siren. Two resistors bias the LTC1799 for a center frequency of about 2KHz. A flyback DC to DC converter circuit, produces a 40v peak signal, which is turned on and off according to the output of the LTC1799. The output is connected to a quality piezoelectric beeper, which has a resonant frequency of about 2.5KHz. The result is a siren which is quite loud but draws only 40ma from a 3v supply. 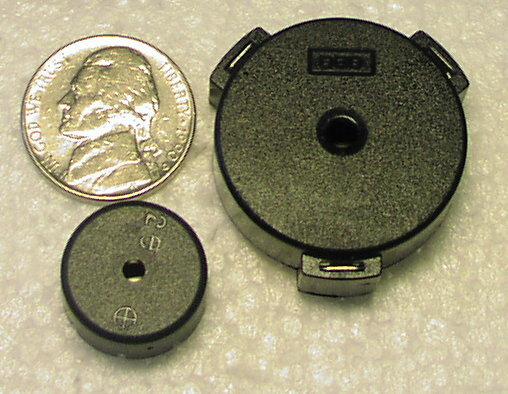 A piezoelectric device from Kobitone, part number 254-PB515-ROX, (Mouser part number 245-PB516) shown above works well. If you want something much smaller, although not quite as loud, try the Murata PKM17EPP-2002-BO shown above (Digikey part number 490-4688).